Many of us now want to have a Diet. Right? We were searching, drinking some products but there were no changes happen. If I’m not wrong, You are planning to drink green tea. correct? Some tea can be a staple in your diet. Green Tea can particularly offer a lot of health benefits that many people find to be a key part of their daily life. It’s great to drink hot or cold. And have a very light, refreshing flavor. You’re Plan is very good! but you may not always know what brand of green tea to try. Especially if you’re new to the concept of drinking green tea. or you may be looking for a new brand for better flavor or a lower cost. In order to help you find the ideal brand of green tea, we’re going to take a look at Davidson’s Tea. to give you some information about the brand of tea as well as positive and negative aspects that customers have found while trying it out. There is an intense focus on creating a symbiotic relationship with nature. that allows both tea-drinking humans and our environment to coexist peacefully. Allows for the highest quality products at a price that is fair to both customers and employees. The goal is to develop blends of tea that really live up to their name in flavor. That means selecting spices and herbs that really add to the recipe. to create a full flavor rather than something that is weak and tasteless. To help give customers access to the greatest possible selection of organic teas. they have an agreement with a high-level organic tea company in India. Between this alliance and their ability to work with small farmers all over the world. 1 pound of green tea leaf for just $10.00. gives you a lot of green tea at a cost that is highly effective. This tea is all natural and organic. It is a really great benefit to have. when products of that quality are typically more expensive end of the market. 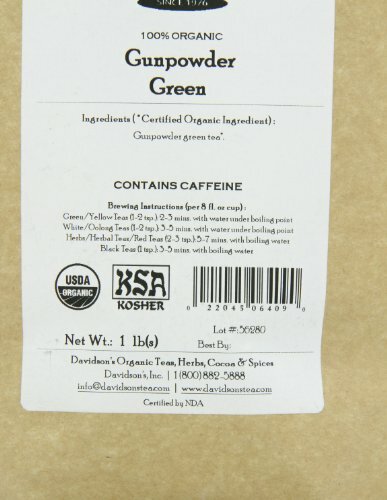 The gunpowder green tea comes from China. It’s certified by the USDA to be organic. which is a high standard to hold and can assure you that when you drink this tea. you are truly drinking something natural and pure. With this tea, you get a deep, full flavor. that is unlike many standard kinds of teas that you find in the US, which are often weaker. Green tea can offer you many benefits, including the boost you get from caffeine with a softer touch. Unlike coffee or caffeine pills. tea can offer you enough caffeine to be alert without giving you jitters or a sharp crash afterward. You can easily make this tea using a coffee maker. or a tea infuser which does require a little more effort than bagged tea. but is still quite easy to make and will offer a quality flavor that is sure to outweigh the process of making it. You won’t have to worry about the caloric effects of drinking a lot of it. and it offers a lot of antioxidants that can greatly benefit your health and well-being. This tea comes in tightly rolled pellets. and packed in a bag that lined with foil to help maintain the freshness of the leaves. In rare occasions, some customers have found bits of debris in the mix. This is something that can happen with organic products. In general, tea can be an extremely soothing drink that is gentle on the body. and allows you to get a little caffeine boost in a very gentle way. It’s a healthy drink that can be made sweeter through the use of honey. or left alone if you enjoy the flavor without any additions. It’s something you can drink any time of day without worry about intense reactions or kept up all night. For those who haven’t had the opportunity to add tea to their diet. 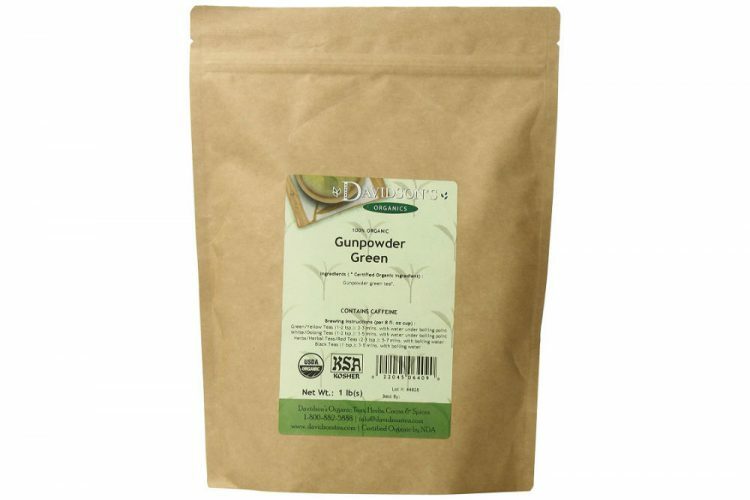 it’s well worth trying out and this gunpowder green tea is an excellent and low-cost way to start. has a lot to offer those who are looking for high amounts of green tea at a lower cost. You can get a pound of the tea without having to break the bank. which makes it very budget friendly, especially for those who drink multiple cups of it daily. Overall, it’s absolutely worth trying out. Just make sure to check for any debris prior to making the tea. Otherwise. by using a coffee filter you will at least be able to keep debris from getting into your drink. This can be a problem for some customers. but to others, it’s just part of the experience with organic, natural products.